Apple's event was described as "truly bizarre" and "the weirdest" by GV partner and former Tech Crunch pundit M.G. Siegler, who went on at length to disparage everything presented as "silly" to "mildly pathetic." Among other things, he wondered aloud why Apple didn't spend any time on stage talking about the old Newsstand—a jab which sort of tipped the whole piece off as not really meant as criticism but rather just mean cynicism. A long effort at "look at me, I'm punching up!" A variety of other writers took similar populist swipes at Apple's event, often belaboring the idea that Apple has changed and that it's all for the worse. Why did Apple spend so much time perfecting a presentation outlining its vision for its future in Services, only to have its invited guests rip all over it and portray everything from its new credit card to video games to digital magazines and original TV programming as being some sort of unpleasant shift, or a high risk, dangerous move that's not what we expect of the company, while also being derided as unlikely to make any real difference in a crowded market? The stridency of Apple's critics is getting ever louder and more shrill, yet with no real or lasting effect. 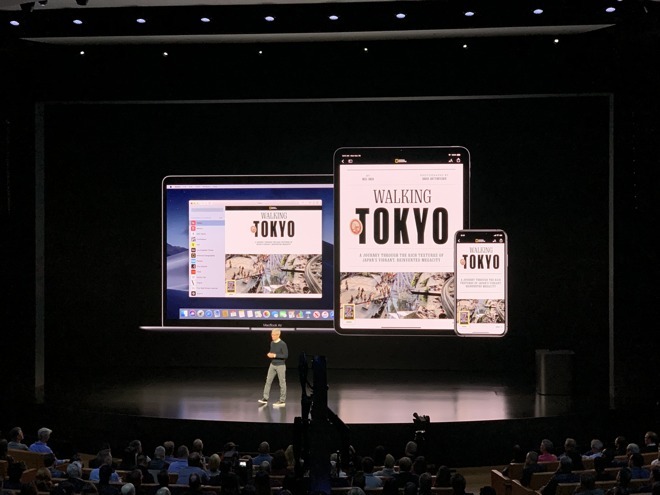 Somewhat ironically, Apple is putting itself out as the savior of journalism with News+, a source of what is supposed to be tightly curated, professional wordsmithing. 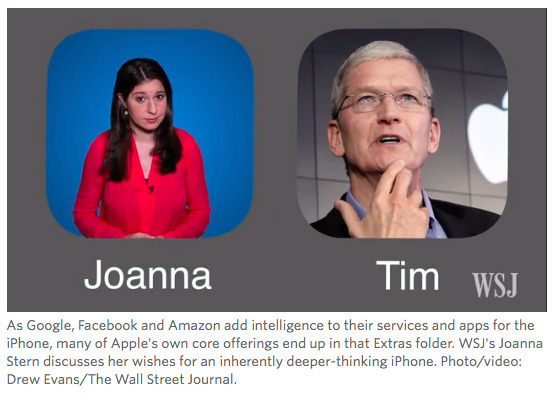 Yet if you look at what Apple's News team curates on the subject of Apple itself, it just isn't very impressive. Apple doesn't seem to be cultivating good writers saying interesting things about the subject of Apple itself, so how will it be doing so in other areas? 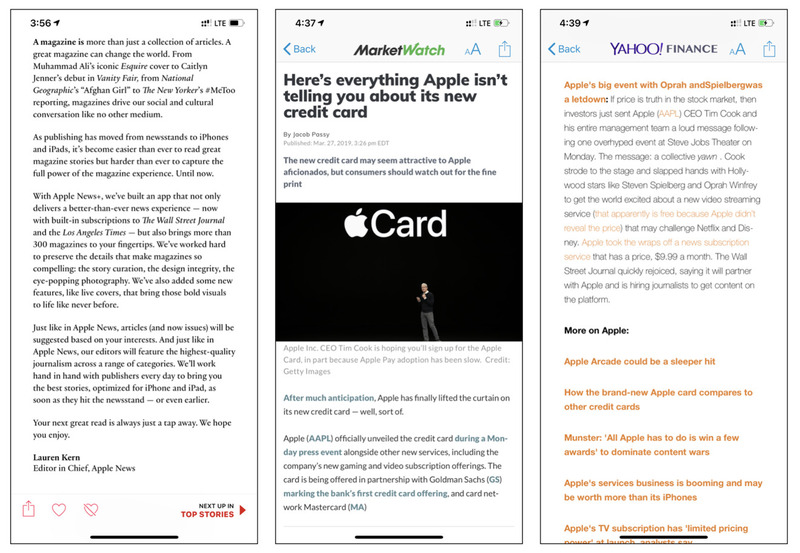 Consider the kind of reporting that currently appears under the topic of Apple in News today: it's almost entirely dumb trash scribbled up by bad writers from non-reputable clickbait sources like MarketWatch and Yahoo. Apple's editor in chief for News, Lauren Kern, drafted her vision for high-quality reporting in a News app announcement, but this message appeared next to News' typical mindless clickbait, such as Jacob Possy literally saying "Apple isn't telling you" things that it tells you in print on its website, and a Yahoo staffer stringing together harsh words that just don't really make any sense. These are not even negative think pieces, just merely boorish concern-twaddle that could be crafted by an AI algorithm trained on the past writing of junior bloggers hired to fill content for newspapers who have fired all of their actual writers and editors because Google and Facebook siphoned off all their revenue. Much of this week's Event coverage was the same sort of thing, meaning that Apple's own website stood out as informative. Perhaps Apple is doing this by design? It was unusual that Apple launched three significant new hardware updates (iPads, iMacs and new AirPods) with little more than a Tweet and web page in the days before the event. It wasn't ineffective; Apple had people talking about the new products for a solid week before hosting its event. 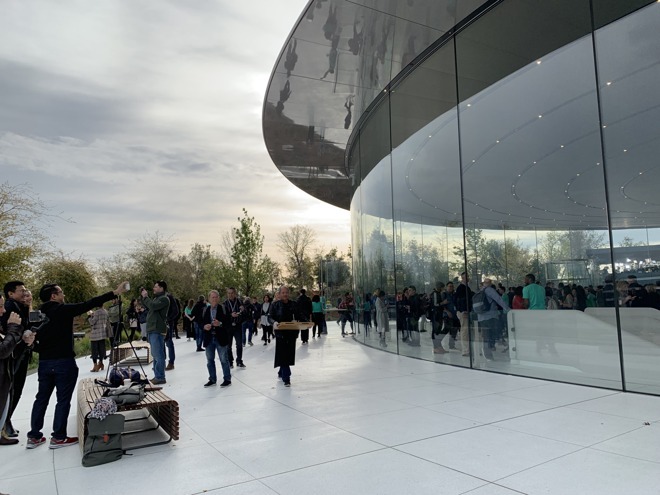 But Apple Park's Steve Jobs Theater was designed specifically to wow attendees with its hands-on product reveal area, one which opens up dramatically after a Keynote to let those in the audience handle the new hardware being released. Yet at this Event, the Theater's cylindrical stone wall was left open from the start, making it clear that the entire show was going to occur on stage, inside the theater itself. Those in attendance saw only a little more of the presentation than those watching the Live Stream from home. In fact, home viewers streaming the event got telescopic close-ups with expertly directed cinematography shot by technicians piloting Apple's robotic arm cameras (visible below). 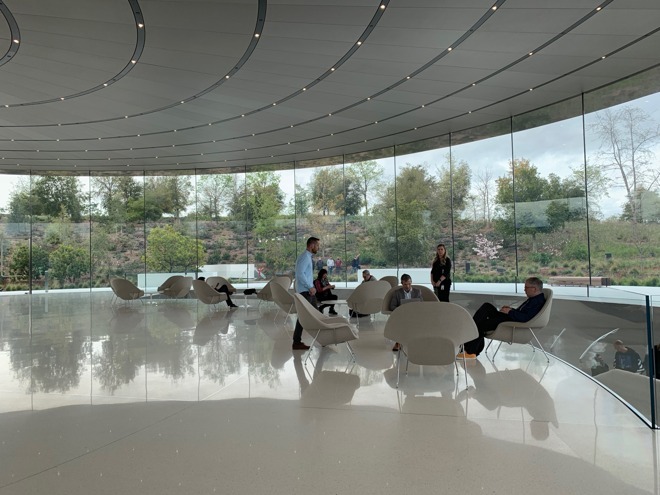 What invited guests uniquely saw was Apple Park itself, a vast monument to Apple's perfectionism and attention to detail, with carefully selected treats laid out in careful rows, and tables offering pour-over coffees and various organic juice mixes. There were a few high fashion chairs laid out to make the entry area of the Theater feel ever so slightly more comfortable than its starkly minimal modernism naturally affords. 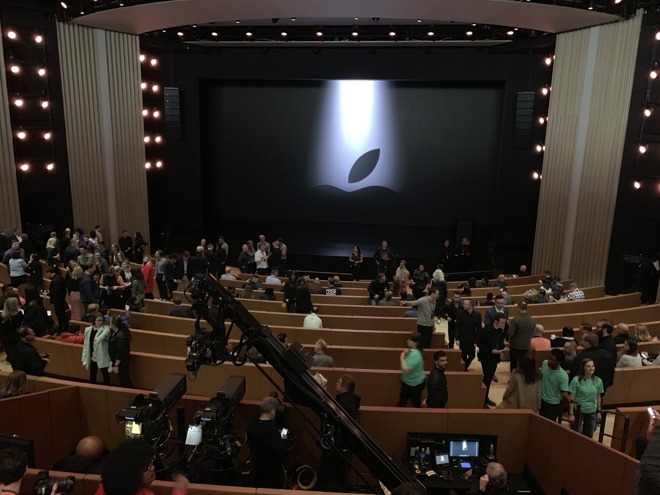 Prior to the show, Apple welcomed its guests with a solid hour or two of socializing among themselves, without guiding any of their conversations. And after the event, attendees were let out to get back home and ponder what they'd seen without any PR coaching or written-up guides telling them what they should think, or say about the presentation. At most corporate PR events, there seems to be stronger efforts to shape the ensuing discussion. It appears Apple has completely given up on trying to sculpt what the media is going to say about its work. Or, alternatively, it feels like Apple doesn't really care what gets written up about its work immediately, as this sort of thing is of minimal value anyway. Recall that 2007's iPhone was shown off to pundits who largely demanded to know when it would run Adobe Flash and Java applets. 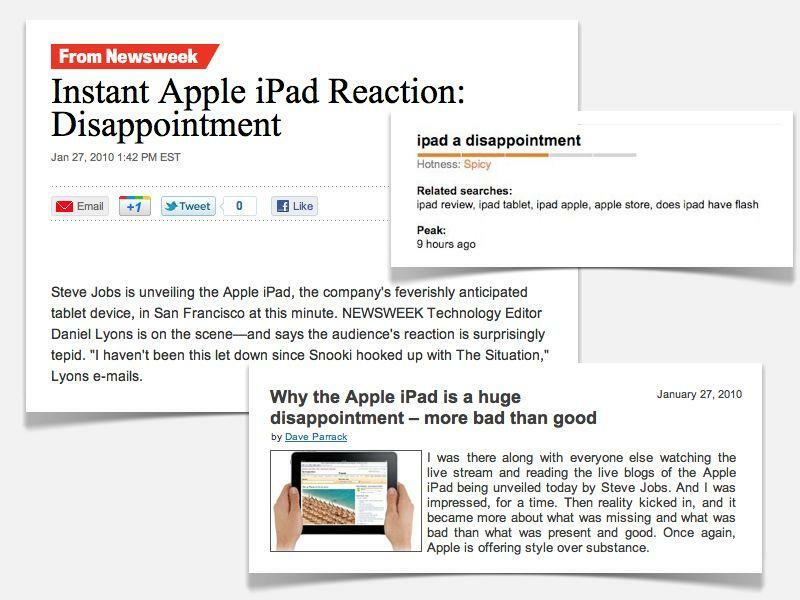 And in 2010, iPad was unveiled to a cranky bunch of skeptics who largely didn't get it and perhaps still don't. Many pundits still apparently think Apple's iPad business is sort of equivalent to Google's, or Samsung's, or Microsoft's —rather than being a $20 billion enterprise in a market where nobody else's tablets even matter and certainly aren't making any money at all or serving much of a real purpose for anyone. Yet Apple's iPad business continues to crank along, incrementally building itself out as a platform capable of launching additional billions worth of the new Services Apple just showed off. Nobody else has the ability to launch such projects to such a vast installed base of premium tablet and smartphone users —one Oprah described as "a billion pockets y'all." None of the pessimism targeting early iPhone and iPad launches had any real effect on what individuals thought of the new hardware. Apple' media critics have similarly only been ineffectually negative on everything from MacBooks to HomePods, insisting that Apple really should be doing the opposite of everything it does. Everything needs to be cheaper and not so thin, of course. Members of the media are cheering among themselves about taking Apple down a peg at any opportunity—like the Wall Street Journal choosing Apple's event week as the timing for unleashing a virally social multimedia presentation offering condescending advice about how MacBooks should just be thicker, because that's what people really want: a thick PC with USB-A ports and maybe a tablet mode featuring detachable bases, m most importantly with no "butterfly" keyboard. The same blogger who had to ask for help in typing up a column with the appearance of being affected by a faulty keyboard—"search and replace" was too complex of an idea to arrive at on one's own —was vainly offering fresh engineering advice to Apple's hardware team, perhaps the most arrogant missive since writing up how Apple should abandon its data privacy schtick because ad surveillance is simply here and there's nothing we can do about it anyway. People who have careers based on outthinking Apple simply haven't contributed much to the world so far. And really, nobody is going to remember any of this in a month. Apple keeps doing its own thing, regularly showing off its work in front of an adversarial media audience that mocks and derides its presentations in a way that is really never seen with the press presentations of Microsoft, Samsung, Google, and certainly not Huawei. There's far more media outrage about Apple putting a Lightning port on the bottom of its Magic Mouse than in Google profiting from the monetizing of child endangerment videos or shoveling ISIS radicalism in front of its most vulnerable viewers. Huawei might be outlined in scathing intelligence reports as being callously sloppy in its own security engineering, but who cares? Apple's cancelation of AirPower is portrayed as a bigger "embarrassment." Where is Steve Jobs' theater? Apple's critics love to say what they imagine Steve Jobs would think about today's Apple. But their logic is often grounded in what Apple was back when Jobs was alive and fails to take into consideration that Apple's current trajectory was both enabled and influenced by Jobs himself. Is Tim Cook's media friendly, Services-focused, celebrity-enthralled Apple really that different from what Jobs aspired to create? A look at what Jobs did across his entire life suggests that today's Apple is not doing anything really out of character, even if it now has Cook's unique fingerprints on it. Jobs was certainly the consummate showman of exciting new hardware, but that's not everything he did. And consider what Jobs did after returning to Apple: he shifted the company's focus from selling as many cheap Macs as possible into a diversified firm focused on selling fashionable Macs capable of supporting an ecosystem including Pro Apps; iWork and iLife software suites; he introduced iPod and in parallel launched a huge media business of selling music, movies, and later apps, before introducing what would become iCloud services. Jobs biggest hit—the world's biggest hit—was iPhone. Yet alongside iPhone hardware sales, Jobs worked to build out flashy glass and steel retail stores to show it off and service the installed base of fanatic users it was creating. His Apple also advanced the success of the App Store as it shifted from just consumer mobile computing apps into the world's largest platform for custom enterprise software and the most successful mobile gaming platform to ever exist—two things "Apple" was supposed to be completely inept at and possibly opposed to. Pretty clearly, Jobs was an open-minded innovator who looked to where the puck was headed, not just the unveiler of new gadgets. 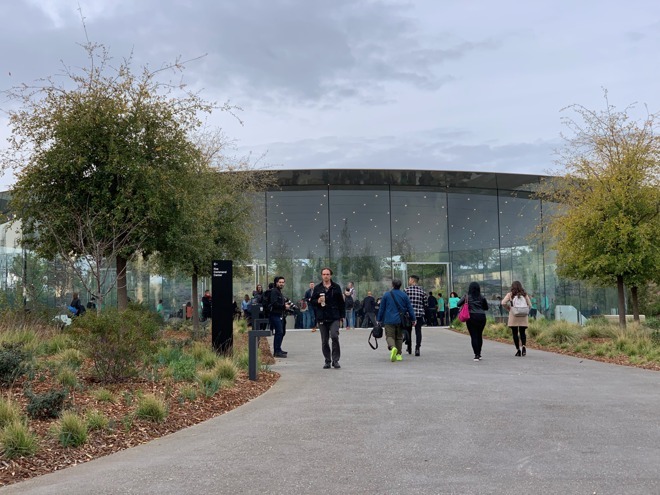 But Jobs' Campus 2, now known as Apple Park, was pretty clearly designed to create exactly what Apple has been doing under Cook: introducing new technologies that work together to enable not just the sale of hardware like iPhones, AirPods, Apple Watch, and HomePod but also to introduce new content markets in the model of iTunes and the App Store, and perfect the flawed beginnings of Jobs-era Services like Newsstand, iWeb, MobileMe, Ping, Apple TV and iPod Games. Rather than being some "weird" new shift, Apple's Services-heavy presentation was showing off a glimpse of the company's vision for building complete new "solutions" of products that combine the hardware we already know about and use with new markets for software and new content for driving satisfaction and stickiness of the ecosystem. That would be right up Steve Jobs' alley.